Your Kokua Is Needed to Save Land! Sign up for HILT Membership! HILT is starting another Membership Challenge, but this time, to include not only Staff and HILT Island Council members, but also the general public! Membership is the foundation which helps provide long-term sustainability for our organization. It is essential. With that said, we are encouraging the participation of HILT Staff and Island Council members, along with the general public to bring in at least 10 new HILT memberships each by year-end to help grow our membership program so we can protect more important lands in Hawai‘i. Participants in HILT's 2015 Membership Challenge have an opportunity to not only help HILT protect more land, but also win exciting prizes! 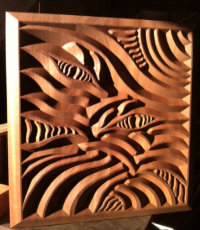 A beautiful sapele wood carving by renowned local craftsman, McD Philpotts. 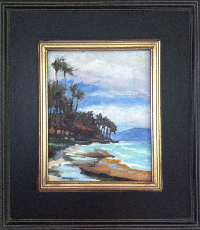 A special and unique 8x10 original oil, framed painting entitled "Honokowai Morning" by renowned local artist, Susan Kean. These two prize categories will include a hotel package with restaurant and activity opportunities on either Hawai‘i Island and/or Kaua‘i, to be announced soon. Note that to be eligible for the membership challenge, all new memberships must be received by HILT and paid in full. Competition starts now and ends on December 31, 2015. Minimum new membership level for this competition is $25 for adults and $15 for youth under 21. $15 gift memberships are not available for the competition. If you are not currently a donor to HILT, your name will be counted toward your new membership total upon receipt of your donation.Please email the names of potential membership recruits, along with those that may sign up through our website, so you may receive credit. Email the names to Ku‘ulei Kuala‘au, Assistant Development Director, at kuulei@hilt.org. For the general public, please email us or call our office at (808) 244-5263 to notify us of your greatly appreciated participation. McD Philpotts, Susan Kean, Peter Merriman, and Mary Charles. and will help HILT #SaveLand in Hawai‘i! Older PostRead HILT's Latest Newsletter!